The Annual PFA Golf Classic is to be hosted on July 10, 2017 at Springdale Golf Club. Registration begins from 10:30 am - 12:00 pm. Hot lunch will be served between 11:00 am - 12:30 pm. Golf-Shot-Gun Start set for 12:30 pm! HERE is the event brochure Please RSVP HERE Springdale Golf Club 1895 Clubhouse Drive, Princeton, NJ 08540 www.springdalegc.org for directions and course information *Date/time is subject to change. 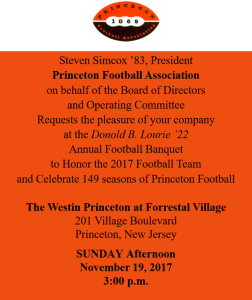 Springdale Golf Club, 1895 Clubhouse Dr.
27th Annual Princeton Football Association Golf Classic Honoring Keith Elias '94, Reggie Harris '94, Brian Kazan '94, Brian Mangene '94, Scott Miller '94, Jim Renna '94 and their '94 teammates Monday, July 9th 10:30 AM to 8:00 PM Springdale Golf Club Princeton, NJ RSVP HERE!